"Monica isn't spending the winter of '77 in her own apartment where there's a narrow, difficult view of the ocean from the small front windows. She's house-sitting in the large ground floor apartment of a Victorian house on the same peninsula, a little to the north and nearer the bay, but without a view of water. Being on the ground floor means that life is no longer dominated by a mid-air view of things, straight out over rooftops. Here, interior light is shaded east and west by other houses; to the south, a back yard screened in by tall, tree-like hedges; in front, to the north, a local avenue, the sound of local traffic, the occasional bass trembling and booming vibration of a truck flying level through sweeping hollows in the roadway, the long quiet spirals of engines approaching and departing. "Living with things she doesn't own, sitting in someone else's chair, in someone else's livingroom, everything in a style she'd never dream of, provides a strange happiness." "Sometimes we feel with dizzying clarity that we're in the midst of our own life, our own story, the impossible, unbound and scattered book that life makes of us, one we choose not to read, preferring any other. Sharp demarcation line of time, like the one we notice after the season's already gone through its hidden changes. Every now and then we get a view of the constellation of mini-narratives in which we're lost. Narratives not so much of the self as of everything that makes itself a satellite of the self, the people and events outside the self that define the self in its least claustrophobic aspect." And ". . . what interests her as a chronicler seems to have as little to do with what's ordinarily meant by realism as it does with what's called imagination." "While Bah-Wah is licking clean a Boursin wrapper on sodden ground in the deep afternoon of February 25, Monica is writing with a yellow, porous-tipped pen. She likes the smell of ink in the coolness of the afternoon's depth and takes note of sunlight burning in the pen's yellow plastic and as a fiery golden rim in the fibers of her mouton's sleeve, a rolled-up shadow of darkest chestnut brown. Now she sees space afresh: a dark plane of brown shade hovers precisely within the image of the yard. The reciprocal emphasis of like things within a boundary=a harmonic bridge within the most random vista. Something that isn't chestnut brown of mouton, saturated near-blackness of hedge bark, black-but-still-brown of earth under hedges, springs up between all, the third reality that exists between every two realities. Against this transparent plane that the eye sees as a fact and the mind abstracts as an idea of the season, a foreground of blazing, sunlit strokes in the stubborn purple-brown leaves stranded through the winter in hedges; in dry grass remnants; in Monica's yellow plastic pen; in the edges of her pages; and absolutely nowhere else. "Bah-Wah as a way for Monica to tune herself to the sheer pleasure of doing nothing (sniffing air). Stormy gusts of wind shake everything that can be shaken, ruffle Bah-Wah's fur, sleek and bristly as evergreen needles. If wind feels warm on the skin, then what is it that still feels cold? The other thread always turning in every thread, a certain seasonal helix, one season always screwed through the other; inner states in outer states always lost to memory." " ‘Why don't you come over later for lunch?’ Slight German accent that resembles a slightly stilted English or the other way around. ‘I prepared something you like!’ Monica catches an aromatic whiff of nostalgic kindliness through cooking. An emotion of astonishing intensity, cosmic and local, though only for the late twentieth century city dweller. Even in town-like neighborhoods it's possible to be pierced with idiotic yearning for the idea of the small town, the village, the gregarious community, the warm and kindly family, offered unassumingly as a simmering kettle of food.
" ‘Oh,’ Lena calls back, a shaky soprano, ‘what did you make?’ Thin as the inner hollow of a reed, what can tempt her? "Ambiguous shadow between one reality and another. Ambiguous receptivity that sometimes arises in someone who can no longer be mothered. Ambiguity of the mothering gesture when a relationship has no mothering in it." 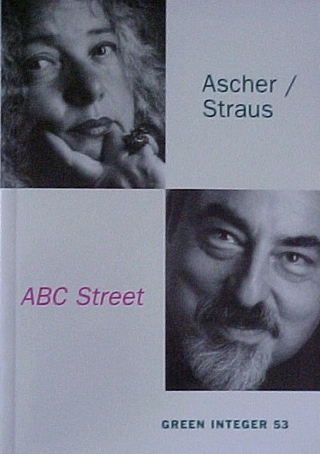 Portions of ABC Street were published in Central Park, Confrontation, Exile (Toronto).